Merry Christmas. Ho, ho, ho. Or is that ha, ha, ha? Never mind a white Christmas; it looks like we're going to have a black Christmas or at least a dark one. From central Canada to the Atlantic Provinces, a major ice storm has left many without power and hydro companies are saying it may take up to 72 hours to get everybody plugged back in. And no wonder. Stroll around the streets and you see a thick coating of ice on everything. Branches have cracked off of trees and in cases, brought down power lines. Pictures are being posted online of hapless homeowners who have had their castles invaded by toppling trees. You can see a few crushed cars to boot. My power went off last night and as of this writing, 6pm, it is still off. An apartment is kind of dark and cold without power. Not the most hospitable of places. But, am I the luckiest guy on the planet? I live four blocks from where I work. Great for commuting; just a ten minute walk. I'm guessing the majority of people without power are cautiously trying not to set their places on fire or are scurrying around looking for as many batteries as they can find. Me? I'm toughing it out at the office. Yes, yes, I work here and who the heck wants to spend their weekend at their place of employment but it sure beats sitting at home in the darkness without the Internet. Please, dear Lord, take anything but my Internet! Hell, you don't expect me to occupy myself with something like (Gasp!) reading a book? If it's true that it may take up to 72 hours for power to be restored, I can't help thinking of the Northeast blackout of 2003. I live in a big city and as to be expected in any metropolitan centre, there is a lot of ambient light, so much so that you can only see some of the stars. The only time I saw the Milky Way was went I left civilisation behind to rough it at a cottage. Imagine my wonderment when I went out for as walk in 2003 and could see the Milky Way downtown. It was truly amazing. It almost made up for the widespread looting. Ha ha. I made that up. Actually, there were a lot of stories of people helping one another out during the blackout. I remember videos of citizens taking it upon themselves to play traffic cop at an intersection. See? When we work together we can bring order to the chaos. Today is laundry day and unfortunately, without power, I will have to contend with that later. (A Christmas day gift? Power and ability to do laundry?) I do have power here at the office so my Internet addiction can continue unabated. Addiction? Ah, I can be hyperbolic at times for effect. It is my connection to the outside world: email, blogging, research, and TV. Yes, I don't own a television set and I don't pay for cable. I have now been out of power for 36 hours. While I spent the entire day at the office yesterday, I did go home at midnight to sleep. There is no hot water, no heat, and no lights obviously. I always shower before going to bed and was considering taking a "cold shower", but opted out. This is where you go under the nozzle just enough to get yourself wet then you turn off the water. You soap yourself down then turn the water back on to rinse yourself off. Since this is cold water, you do your best to not spend any unnecessary time under the nozzle. It's cold!!! I'm back at my desk at work. This morning's news reports state that crews are out doing their best but apparently it's quite a mess. It's not just a question of getting power back on, it's that downed trees have to be removed to get the lines back up. The CEO of Toronto Hydro came out and said that some people may not get their power back until after Christmas. I look out my office window and I can see where my apartment building is. Great swaths of houses are dark. What to do tonight? Sleep at the office? Heck, when do I get a shower? I just walked over my apartment building. There are more blocks with lights on but there are still a number without. Guess what? I go down the row of buildings all lit up only to discover mine is still dark. I must be on another grid. Damn. Night number two without heat. Somebody at the office mentioned my gym is back up and running so I think I'll mosey over there for a shower. At least I have options. This is a promising sign that tomorrow, I'll be back in business. Last night, I had a wonderful shower at my gym around the corner. They got their power back and were open for business. I came back to the office for a snack and an herbal tea before going to my apartment. It's getting cold. Like pipe freezing cold. How many days before the super has to contend with bursting pipes? Once I get into bed and shiver from the cold sheets, I settle in and get quite toasty. That is one fine duvet I have. Of course, getting out of bed in the morning means moving as fast as possible. It's cold! It is also testimony of how fast I can move in the morning. Ha, ha. Usually I like to get out of bed bleary eyed and nurse a cup of coffee before I in any way resemble something civilised. This morning, I was up, dressed, shaved, and out the door in less than ten minutes. Of course, what's the carrot at the end of the stick? What's the motivating factor? A cup of coffee at the office! I have my fingers crossed that today the power comes back on and I can get back to normal. But, I still have Plan B: my office. And if it gets too cold, there's a cot here where I can sleep. I have options. The super of my building just called to let me know they got the heat turned back on in my building. There's still no electricity but at least I won't freeze tonight when I go to bed. I visited my apartment. Still no power, but along with heat I have hot water. Woo-hoo! *fist pump* I can take a shower. It seems management succeeded in running a cable from the building next door with electricity to power up the heat and hot water. All right! I'm guessing it will be another night without power. FYI: It is a beautiful sunny afternoon; cold, but pretty. When I look out the office window over the residential neighbourhoods, it is like I am looking at crystal trees. The ice is lit up by the sun which makes for a beautiful landscape. Merry Christmas. Ho, ho, ho. Still no power and I'm back sitting in my office. Will today be the day? Last night, I made my first step in plan B: I rinsed out some socks and underwear. I have clean clothes to the end of the week, but if I don't have power back by Friday, I better go out and find a functioning laundromat. FYI: You're going to ask. Christmas by yourself? My relatives live in another city and I am scheduled to rent a car and drive out of town this coming Sunday. Christmas for me is spent by myself: a day of reflection and writing. And this year without electricity. Ha. Here we go: day #5. At least I have heat and hot water. But I stumble out of bed, get dressed, and immediately walk to the office to get a cup of coffee. No lounging around in my bathrobe. Ha, ha. I go to the movies last night and tell the lady at the ticket counter of my plight. She says that she's living in a hotel. Oh wow. I am lucky. As a walked home through darkened neighbourhoods, I couldn't help wondering how many are going to have to contend with burst pipes. 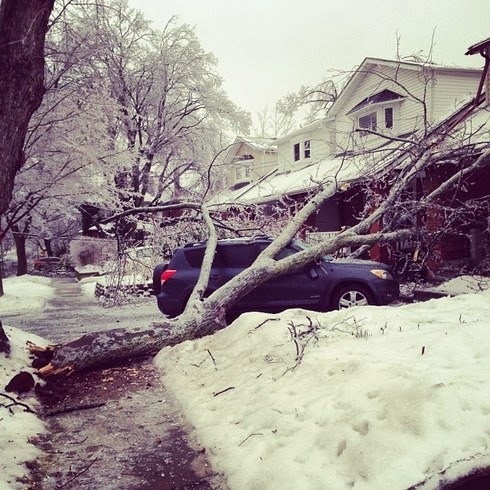 According to this morning news, there are still nearly 55,000 in Toronto without power. Night #5 without power and now the start of day #6. I've asked management if they would let me into the building next door with power to do some laundry. In the meantime, it's back to the office where I have power and Internet access. This is going to be night #7. Judging by the fallen trees in the neighbourhood, I'm guessing my power will be out for the entire weekend. The power came back on at 12:50am. I've come back to the office to pick up all my things and move back to my apartment. I'll be curious to stroll around the adjacent neighbourhoods. I wonder how long others may be without power. I'm considering myself lucky. As I've said, I had options. How many people spent the week with a candle? I brazenly stole the above photo I found in Google image search. But, credit where credit is due: Photo by joannabananaface. Above, I wrote "ice storm shmice storm" and forever curious, I found an entry on this construction of derision. "Baby-shmaby". He's already 5 years old! The top priority is restoring power to the two hospitals and the city's water system, all of which are running on back-up power. Crews will then focus on outages that are affecting a large number of customers before moving on to smaller outages. The Northeast blackout of 2003 was a widespread power outage that occurred throughout parts of the Northeastern and Midwestern United States and the Canadian province of Ontario on Thursday, August 14, 2003, just before 4:10 p.m. EDT. Sorry you're powerless...but it sounds like you're being very creative about it. I often lose power in my neighborhood, big trees and old above-ground power lines. I've learned to cope but it's no fun. Here in Virginia we've been having temperatures in the 60 to 70 range. Very strange times! Here's hoping you get your Christmas wish! Relationships: Will we ever get it right?